Citrus Heights Irrigation District formally came into existence on October 25th, 1920, the last of three such Districts formed in northeast Sacramento County. The District was organized under the State Water Code Irrigation District Act. It encompassed slightly more than 4.7 square miles (3,028 acres) in northeast Sacramento County at its inception and served approximately 225 farms. In February of 1921, the first election of Board members took place with 112 votes being cast. In 1951, the Directors of Citrus Heights Irrigation District, Fair Oaks Water District and Orange Vale Water Company formed the San Juan Water Districts Association. This Association and ensuing discussions, negotiations and two-thirds vote of the people ultimately led to the 1954 creation of the San Juan Suburban Water District as the first Community Services District in the State of California. Citrus Heights Irrigation District Director, Sidney Peterson, was selected serve on the first San Juan Suburban Water District Board of Directors, a position that he held until 1976. The District encompassed slightly more than 4.7 square miles in northeast Sacramento County at its inception and served approximately 225 farms. In 1994 the District changed its name from Citrus Heights Irrigation District to Citrus Heights Water District to better reflect the business of the District. Citing the desire to bring government closer to the people and to provide for better coordination of infrastructure planning and construction activities, Citrus Heights Water District provided financial support to the Citrus Heights incorporation effort, contributing in a small way to Citrus Heights’ cityhood in 1997. That effort has been beneficial for the District in accessing grant funds for fire protection improvements and in the close coordination of project planning efforts with the city and fire agency. The District today has grown to over 12 square miles (7,800 acres) in territory serving a population of about 67,000 in five communities to include approximately two-thirds of the City of Citrus Heights and portions of Fair Oaks, Orangevale, Carmichael, and Roseville. The staff now includes 30 full-time regular employees with 23 employees certified as water distribution operators, 16 certified as water treatment operators and 2 certified as water conservation specialists. The District’s 2015 Operating Budget is $9.67 million and its Capital Improvement Budget is $6.8 million. Included in the Operating Budget is $2.30 million for purchase of surface water from San Juan Water District. Customers are billed bi-monthly for water service and water consumed. The 2015 water rate for the average single-family-home customer is composed of a bi-monthly service charge of $56.13 plus a charge of $0.7663 per unit of water used. A unit of water is 100 cubic feet, equal to about 748 gallons of water. 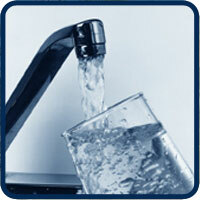 The District believes that its water service is a great value. The District delivers high-quality water that meets all state and federal drinking water standards to each customer’s home or business at an average cost of about one dollar for every 345 gallons of water used, which includes the service charge and cost of water. According to its most recent survey of 20 water agencies in the Sacramento region, Citrus Heights Water District’s typical water rate is below the average for the Sacramento region by over 27 percent.